BALTIMORE Woman Captain Corsaire rain parka. 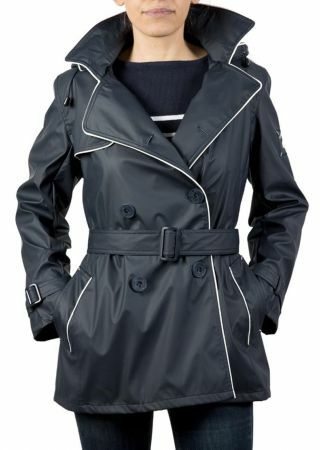 Women's rain coat 3 in 1. 1 parka function for rain or sea. 1 parka + polar function for cold winter or at sea. Can be worn both in summer and winter. Waterproof seams and a fleece inner lining. White with a lining and red zips. 1 Ventilation under the sleeves. CHERBOURG trench coat Hublot woman. with removable hood and belt. Polyurethane waxed, lined with striped jersey. Milieu devant zippé caché sous patte fermée par pressions. Manches retroussables laissant apparaitre la doublure intérieure du ciré. 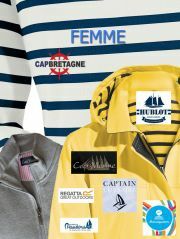 RÉGATE woman rain parka SUMMER woman Captain Corsaire. Collar has a side edge. Zip and button placket with pressures. Adjustable hem of the sleeves. 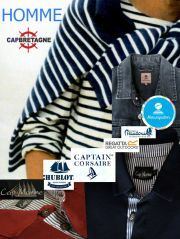 REGATE woman rain parka WINTER Captain Corsaire. Very soft lining in striped and polar jersey. Zip closure and button placket with press studs. Pockets folded. Adjustable sleeve bottom.